Technical Data for Durachem® Products. *Chemical penetration testing was conducted in accordance with ASTM F 903 Procedure C.
*Class 1 chemical challenge levels are 20 g/m2 for liquids and 10,000 ppm for gases and vapors. Class 2 chemical challenge levels are 10 g/m2 for liquids and 350 ppm for gases and vapors. If you need to document a Kappler fabric against a specific chemical hazard not already in our database, we make it easy with a custom testing program. We'll conduct third-party testing on your chemical, and if the fabric meets your requirements you agree to purchase a standard minimum number of garments. For details contact Customer Service at 1-800-600-4019 or email us at customerservice@kappler.com. 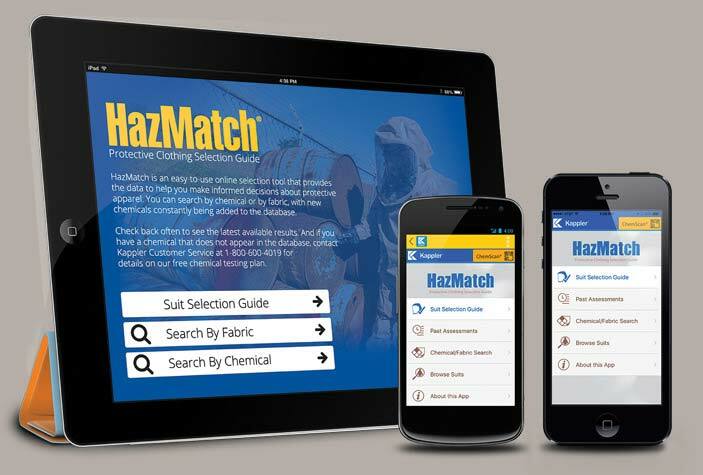 An selection tool that provides the data to help you make informed decisions about protective apparel.